The great works of art constructed under Hatshepsut, the only female pharaoh, lasted barely longer than her 16-year reign. Only fragments carved from granite and limestone remain of her once-obscured legacy. As was Egyptian custom, Hatshepsut married her half-brother, Thutmose II, and upon their father's death became Egypt's queen. Following Thutmose II's death, Hatshepsut served as regent for his son (born to a member of his harem), Thutmose III. 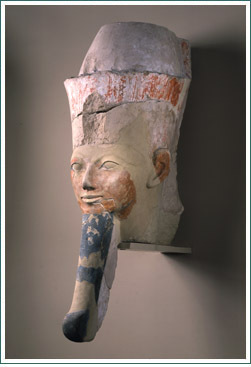 Approximately seven years into his reign, the influential Hatshepsut ordered herself crowned as pharaoh. Nowhere in the pieces of her royal statuary was it evident that Hatshepsut was female: She was depicted in traditional ceremonial garb, which included the false beard worn by all pharaohs, and she was portrayed as other pharaohs had been -- as an enthroned leader, sphinx, and god of the underworld. Her reign (c. 1473-1458 B.C.) was prosperous. Hatshepsut received land tributes from Asia, Nubia, and Libya, and launched a successful expedition to Somalia which reaped ebony, gold, jewels, myrrh, even baboons. She poured the spoils of this expedition into a building program. Restoration of damaged temples and monuments built by her predecessors was rivaled only by her construction of new ones. Her crowning glory was her temple at Deir al-Bahri in Western Thebes; within are reliefs that chronicled the major events of her reign. These reliefs secure Hatshepsut's place in history. When she died -- apparently of natural causes -- Ramses III became both her successor and destroyer, leading an effort to erase her name from history. Her name was deleted from the list of pharaohs, her temples dedicated to others, her statues and monuments largely destroyed. Most of Hatshepsut's royal statuary was collected during the Met's Egyptian Excavation in the early 1920s, near Deir al-Bahri. The broken statue of her torso was discovered earlier, in 1869. For the first time since their destruction around 1460 B.C., the pieces are reunited, in the Met's Egyptian Art collection.